At Soul La Belle Beauty & Wellbeing, we offer a range of weight loss treatments that are 100% safe, pain free and non-invasive and will suit a variety of different needs. All of our machines are new and top of the line so we can guarantee a safe treatment and the most effective results. Ultrasound Fat Cavitation is a non-invasive alternative to liposuction, designed to help you trim stubborn areas of fat quickly. It involves the removal of fat cells and cellulite by using Ultrasound waves that melt your fat and eliminate them through the lymphatic system. Basically, the ultrasound waves are simply helping the fat to move out of the body more quickly than it would on its own. It is safe and painless as there is no surgery or anaesthetic involved. This technique can aid not only in fat loss but in tightening the skin and reducing cellulite. That’s why it is especially popular for people who have been losing weight on their own but having trouble with certain areas or with loose skin. It is also a popular choice for post pregnancy weight loss for the same reason. It is the only method apart from liposuction that can effectively help you spot reduce the parts of your body you have the most problems with; whether it’s your stomach, thighs, buttocks, arms or even neck. If you have questions about any other specialty areas you would like to focus on, feel free to speak to one of our friendly staff members for more information. For most effective results, we focus on only one area per session. Results will vary depending on your body type and how much fat you have to lose but we usually recommending completing 4-6 sessions. We will help you decide how many sessions would be right for your personal goals. 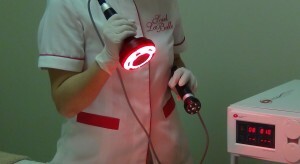 The combination of Radio Frequency (RF) and Red LED Light Therapy is the latest technology that is designed to tighten and firm up skin, reduce cellulite and reduce the appearance of fine lines, wrinkles and scars. It can be used for both body and facial skin tightening for a younger, fitter look. RF energy is a form of electromagnetic energy that’s safe and effective for all skin types and colours and best of all; it is non-invasive and doesn’t hurt. It works by using radio frequency waves to reconstruct the tissue layers deep beneath the skin. The deep heating tightens the collagen in your dermis and subcutaneous tissue while stimulating new collagen at the same time for improved elasticity in the skin. At the same time, it cools the epidermis keeping the outer layers of your skin safe. That means there is no recovery time needed and the results will be visible instantly. RF is mainly used to improve the look of sagging facial tissue; especially the forehead area, under eyes, cheeks, mid face, jaw line and the neck. This holistic treatment combines natural ingredients with specialised massage techniques to detoxify and eliminate fatty tissue while at the same time, relaxing the muscles. It includes papaya for exfoliation, essential oils to improve the look of cellulite and a refining sauna mask made of clay to leave your skin feeling fresher than ever. For full details on pricing or to book an appointment, call us on (07) 3349 8313 or simply drop by to speak to one of our friendly staff members.